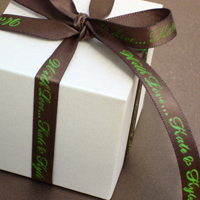 Personalized ribbon is a must-have embellishment for all of your party favors and packaging. 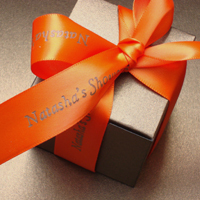 Custom text is printed on soft satin ribbon that will enhance already pretty packaging and elevate its elegance and sophistication. Now you can find it in our store, available in three widths: 3/8″, 5/8″ and 7/8″ in a variety of colors! 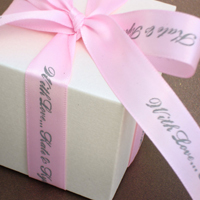 Soft satin ribbon is a natural choice to add an elegant pop of color to favor packaging, especially favor boxes. Now satin ribbon can be made even more special with a line of personalized text! Personalized satin ribbon can be used to tie sparklers to personalized matchbooks, or even as a pretty embellishment around a bundle of flatware. With so many options, let your creativity flow to add special touches to multiple projects.